A beautiful Shunammite, brought by the servants of David to his harem to minister to the aged king in the hope of reviving his failing powers (I Kings, i. 1-5). After the accession of Solomon, Adonijah, his elder brother, sought through Bathsheba to secure Abishag as his wife. Solomon, interpreting this request for the wife of the late king as evidence of a plot on the part of Adonijah to strengthen his claim to the throne (since according to archaic law, a man's concubines became the inheritance of his heir), put his rival to death (I Kings, ii. 12-24). Abishag, the Shunammite, though only half as beautiful as Sarah, merited the rank of queen on account of her beauty (Sanh. 39b). David did not marry her, since he had already the allotted number of eighteen wives (see Sanh. ii. 3, 21a), and he preferred to renounce the lovely virgin rather than send away one of his wedded wives (ib. 22a). 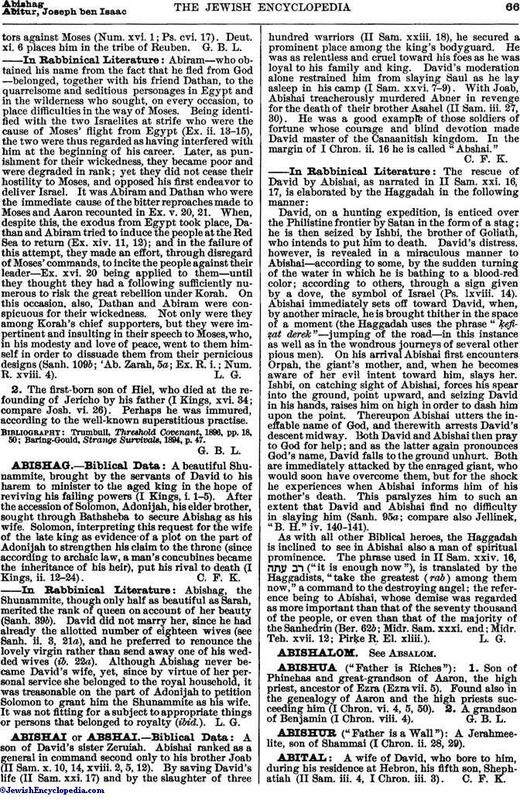 Although Abishag never became David's wife, yet, since by virtue of her personal service she belonged to the royal household, it was treasonable on the part of Adonijah to petition Solomon to grant him the Shunammite as his wife. It was not fitting for a subject to appropriate things or persons that belonged to royalty (ibid. ).